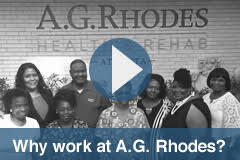 Approximately 600 employees are proud to work for A.G. Rhodes. We are a mission-driven workforce, committed to excellence in everything we do. One way we recognize staff members who demonstrate exemplary commitment and dedication in the workplace is through annual awards and other accolades, and we are proud to celebrate distinguished honors earned in the community. Read about our latest accomplishments. The Atlanta Journal-Constitution has once again recognized A.G. Rhodes as a top workplace. This is the sixth year in a row A.G. Rhodes has been included in the list. 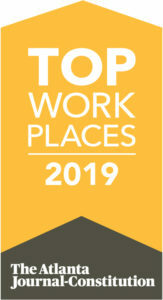 More than 4,300 companies were nominated or asked to participate in the 2019 Top Workplaces contest by The Atlanta Journal-Constitution and its partner, Energage (formerly Workplace Dynamics). Using survey results, a list of 150 workplaces was compiled, consisting of 20 large companies (500 or more employees), 55 midsize companies (150-499 employees) and 75 small companies (149 or fewer employees). A.G. Rhodes was included among the large companies recognized. A.G. Rhodes also received special recognition for its training. For more information, visit www.ajc.com/top-workplaces. 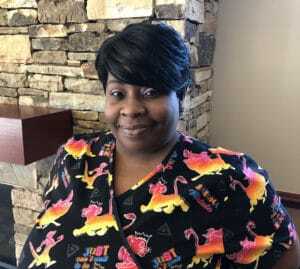 When you meet LaToya Hester, a Certified Nursing Assistant (CNA) at A.G. Rhodes’ Cobb location, it’s easy to see why she was selected for this month’s employee spotlight. With a smile on her face, Hester proudly talked about her job at A.G. Rhodes, and her reasons for getting into the long-term care field. When asked what her job entailed, Hester didn’t talk about her daily tasks with elders, rather she focused on something far more meaningful. Hester—a Michigan native—started working in long-term care in 2001. 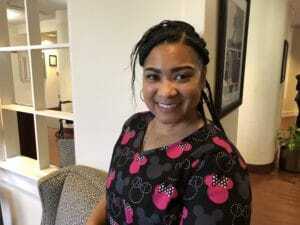 When her husband’s job transfer brought her family from Michigan to the metro Atlanta area, she started working at A.G. Rhodes in November 2017. Melanie Haders, Administrator at A.G. Rhodes of Cobb, said Hester is a natural fit at A.G. Rhodes. It’s a demanding job, but Hester said it’s incredibly rewarding. When asked what qualities it takes to work in this field, Hester acknowledged that you have to address various needs, and interact with a lot of people including the elders, their families and staff. Hester also recognized the importance of teamwork in this field, and she’s been impressed with the teamwork at A.G. Rhodes. Hester and her husband of nearly 15 years living in Powder Springs with their two daughters who will be 14 and five this year. When she’s not working, Hester enjoys spending time with her family and going to parks, museums, eating out and shopping. 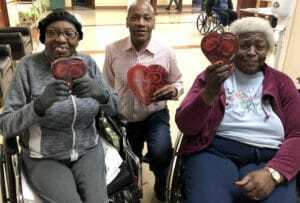 LC Barnes (center) has a giving nature, and recently brought Valentine’s treats for residents at A.G. Rhodes of Atlanta. To LC Barnes, an employee who’s been working at A.G. Rhodes of Atlanta for about a year with Unidine dining services, it was no big deal when he brought in Valentine’s candy boxes for each resident, or when he gave out small gifts during the holidays and threw residents a party. When Barnes was a child, his parents started an organization to help women in domestic violence situations, and he saw them give items and money to help support this cause. Barnes grew up seeing generosity and philanthropy in action, and it’s ingrained in his DNA. Kristie Davis, Administrator of A.G. Rhodes of Atlanta, said that she and other staff—and the residents—have been touched by Barnes’ thoughtfulness. Barnes has a natural inclination to lift up others, and says he is drawn to seniors. “They have paved the way for me. They had to climb so many ladders, and they’ve opened so many doors for me to continue to follow in their footsteps,” he said. Barnes reminds us all that small gestures leave a big impact. Most of us who lived in the Atlanta area in 2014 recall the snow and ice storm that paralyzed the city. For Antoinette Ellerbee, a Licensed Practical Nurse (LPN) and supervisor at A.G. Rhodes of Atlanta, she remembers it well. She camped out at the nursing home for three days to make sure residents were taken care of. Ellerbee, a South Carolina native who started her long-term care career at A.G. Rhodes nearly 15 years ago, says laughter helps her get through the stressful situations. With a smile on her face, Ellerbee spoke fondly of her reason for getting into long-term care. 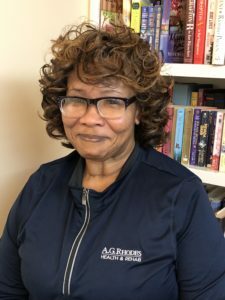 Ellerbee works as a supervisor on the 3-11 p.m. shift, and primarily works with residents who come to A.G. Rhodes for a short-term stay to recover from surgery or an illness, and then discharge home or to another level of care such as assisted living. She says she enjoys the satisfaction of seeing residents improve after their stay. Ellerbee acknowledges that there are certain qualities you should have to work in long-term care. She also recognizes that family members are an important part of the equation. 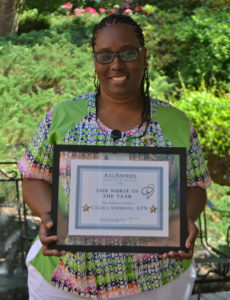 Ellerbee received the Nurse of the Year award in 2008, and Davis said it was time they recognized her for the employee spotlight because she’s been such a consistent team player for her entire service at A.G. Rhodes.